Are only client funds deposited in the trust account, except attorney funds sufficient to open or service the account or funds belonging in part to a client, third party, or lawyer? Is your general trust account designated as an IOLTA account and located at a bank with branches in North Carolina? When funds belonging in part to you and in part to the client (e.g., a client check for legal fees and court costs) are received, are the funds deposited intact into the trust account? Are trust account checks for legal fees or expenses made payable to you or your firm entered as disbursements on the client’s ledger card? Are all items drawn on a trust account made payable to a specific person or entity and not cash or bearer? Has a bank directive been filed with the bank where a trust account is maintained? Is the client promptly notified of the receipt of any entrusted property belonging in whole or in part to the client? Is entrusted property to which the client is entitled promptly delivered to the client or third persons as directed by the client? Have you promptly reported to the State Bar any knowledge or reasonable belief that entrusted property has been misappropriated or misapplied? Have you complied with escheat requirements on abandoned or unidentified property? Do bank receipts or deposit slips list the source of funds and date of deposit? For deposits to the general trust account, do bank receipts or deposit slips also list the name of the client or other person to whom the funds belong and the source of funds if other than personal? If records of canceled checks are furnished by the bank in digital image or CD-ROM format, do the images meet the requirements of Rule 1.15-3(b)(2)(A)? Do they show the amount, date, payee, and the client balance against which the item is drawn? Is the digital image a legible reproduction of front AND back of the original item and not smaller than 1 3/16 x 3 inches? Does the bank maintain, for at least six years, the ability to reproduce electronically additional or enlarged images within a reasonable time? Are you retaining these records for the required six-year period? Are you retaining all instructions to transfer, disburse, or withdraw funds from the trust account including electronic or written transfer records? Are you retaining, for at least six years, all bank statements and other documents received from the bank regarding the trust account, including any notices of insufficient funds? Are you maintaining a ledger containing a record of receipts and disbursements for each person or entity from whom or for whom funds are received? Does this ledger show the current and accurate balance of funds held in the trust account for each person or entity? Are general trust accounts reconciled monthly in the following manner: the balance of the trust account as shown in your records is reconciled with the current bank statement balance for the trust account? Are general trust accounts reconciled at least quarterly in the following manner: the individual client balances shown on the ledgers are totaled and reconciled with the current bank statement balance for the trust account as a whole? Are written accountings provided to the client upon the final disbursement of funds (i.e, when the balance reaches zero), when reasonably requested by client, and at least annually if funds are retained more than 12 months? Are complete and accurate records (deposit slips, ledgers, reconciliations, etc.) of all entrusted property received by the lawyer retained for six years from the last transaction to which the record pertains? If you answered “no” to any of these questions, or if you have any questions regarding trust accounting procedures, please review the Lawyer’s Trust Account Handbook, available on our website at ncbar.gov/menu/publications. Peter Bolac joined the State Bar in 2011 as Trust Account Compliance Counsel and District Bar Liaison. As Trust Account Counsel, he oversees the new trust account compliance program, which helps lawyers improve trust account practices and mitigate disciplinary action. Contact Peter at pbolac@ncbar.gov or 919.828.4620. This article first appeared in The North Carolina State Bar Journal Spring 2012 issue, Volume 17, Number 1.Reprinted with permission. Rule 1.15-2(k) of the Rules of Professional Conduct requires a lawyer to direct each bank where he or she maintains a trust account to notify the State Bar when any item drawn on the trust account is presented for payment against insufficient funds. The directive can be found at ncbar.gov/pdfs/11.pdf. Rule 1.15-1(d). “Entrusted property" denotes trust funds, fiduciary funds, and other property belonging to someone other than the lawyer which is in the lawyer's possession or control in connection with the performance of legal services or professional fiduciary services. 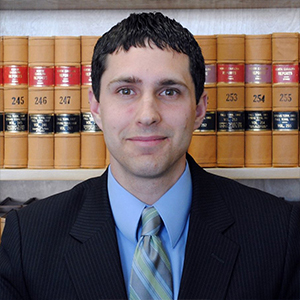 Peter Bolac joined the State Bar in 2011 as Trust Account Compliance Counsel and District Bar Liaison. As Trust Account Counsel, he oversees the new trust account compliance program, which helps lawyers improve trust account practices and mitigate disciplinary action.